Gates lodge is a Victorian Grade 2 listed quality AA 4 star with gold award self-catering 1 bedroom detached cottage. Converted in 2011 from the original Cart-Lodge and Stable, it is situated in the grounds of a former 16th Century Farmhouse and Inn. You will be surrounded by thousands of acres of farmland, adjacent to a 40 acre common, home to free-roaming horses between May - October and SSSI designated. Professionally and thoughtfully converted to provide a very high standard of self catering accommodation, it is absolutely ideal for couples or discerning families who are looking for a full self-contained country haven in one of England's rarest unspoilt locations. Warm, sunny and bright, Gates Lodge is equipped with all modern conveniences, whilst retaining its original character with exposed oak beams and vaulted ceilings. Country Kitchen with all modern appliances, everything you need including dishwasher. washing machine, Bosch oven and hob. Lovely lounge with wood-burner and sofa bed. Own private garden which is sunny most of the day. Garden is safe for kids and you have use of 40 acres of nature reserve common to explore and play on, with horses roaming free mid May-mid October, ideal for pic nic and walks. You can walk to the village of Fressingfield in 45 mins through endless countryside (or drive there in 5!) and have a top quality lunch at the Fox & Goose overlooking the duckpond. Local Leisure and Attractions: Lots to see and do, for adults and children alike. Just simply to walk around the site is a therapeutic experience in itself, but as well as the endless country lanes and field walks around us, close by is the renowned Heritage Coast, endless sandy beaches and unspoiled old fashioned picturesque seaside towns such as Aldeburgh and Southwold with its Pier. Fantastic views and natural surroundings such as Minsmere, Dunwich and Walberswick, and of course the renowned Norfolk Broads. The region is full of educational as well as fun historical attractions including Sutton Hoo, Orford and Framlingham Castles, and the Gressenhall Museum of Norfolk Country Life. Other family activities include the excellent Southwold Maize Maze, Africa Alive, and Bressingham Zoo and Steam museum. The region is famous for supporting the War effort and is dotted with many former Airfields and transport museums close by, such as Flixton. There are also various outlets for horse riding lessons, golf and fishing. Gates Lodge, part of Jolly Farmers, was the original cart lodge and stable and beer store when it was a pub from the early 1800s to 1968. You can see why the farmer owner at the time capitalised on its location because it is truly in the middle of the countryside surrounded by fields and the regular influx of farmers made the beer-house trade an attractive proposition. Nowadays we run the business as one of the most attractive and peaceful self-catering units in the East Coastal area, now designated as SSSI and close to the renowned Heritage coast, Southwold , Minsmere and Pensthorpe to name a few. Modern electric power shower, toilet and basin. Lovely warm wood burner with log store. Large living area, overlooking fields and farmland. Abundance of wildlife with many opportunities to spot Barn Owls and Hares. Bespoke locally hand crafted kitchen, oak beamed, vaulted ceiling. All new in 2011 with modern quality utilities. Dining area with rustic table and chairs seats 4. Large selection of books available including bird books. a small selection of DVDs available for use. Separate private garden for customers with patio and BBQ. Rustic bench and table and chairs. The Lodge is completely detached and self-contained and the prices include all electricity / hot water / Linen. Guests also have use of a separate garden, with patio / BBQ area, washing line and table/chairs which has been newly landscaped and stocked with shrubs and trees. The site sits on the 40-acre common, home to free roaming horses between mid May and mid October which often come to visit at the gate. Guests can take the many routes available including many footpath walks across miles of open fields and can include a lovely scenic walk to the local village with local shop, Historical flint-built Church and the very famous Michelin-starred Fox and Goose Pub and Restaurant, formerly the Guildhall, dating from the medieval period, where you can relax in delightful surroundings indoors or wind down with a drink overlooking the duck pond. Further afield there are many attractions to suit all ages including being 30min from the sandy beaches. Please see our website. We found difficulty in locating this property, expecting the Jolly Farmer to be a pub. The indistinct sign, at the entrance to the property, didn't help and perhaps should be addressed. However, we enjoyed the tranquil surroundings, with the proximity to the Common and the wild horses. Inside the property, which is actually in the grounds of the main residence, there was ample space in the light and airy open-plan living accommodation. There was just enough space in the bedroom. However, the size of the room containing the shower/toilet/washhandbasin left a lot to be desired. I do appreciate the restrictions in the planning of this cottage accommodation but these facilities have been compromised. The other frustration was the inconsistency of the WiFi reception, particularly as we relied upon it to send updates, of my long Charity walk,to my grandson. Excellent holiday cottage in a beautiful location. Brilliant location. Ideally suited for a quiet, relaxing away from it all holiday. Good size accomodation with everything you could possibly need. Being able to park next to the lodge is a bonus. 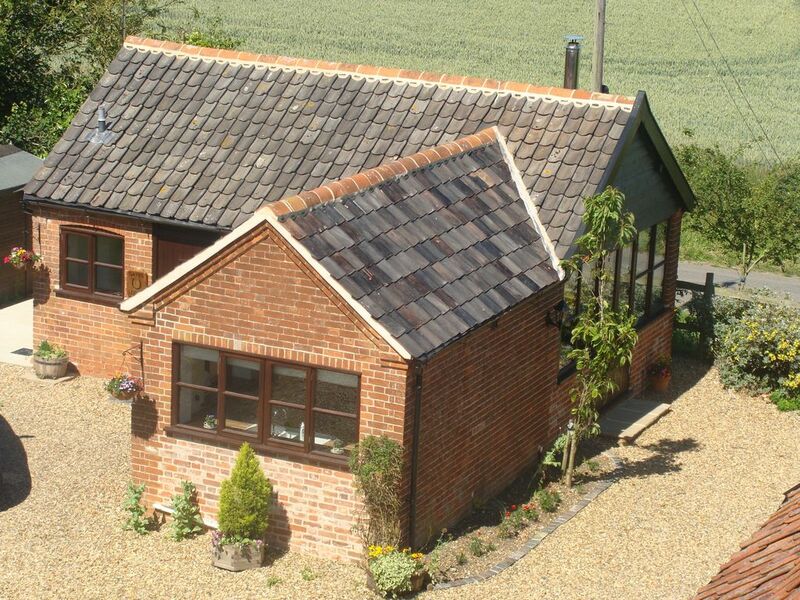 A beautiful setting and comfortable place to stay whilst exploring the Suffolk countryside and coast. Das Ferienhaus ist liebevoll eingerichtet und hochwertig renoviert. Alles Notwendige ist vorhanden. Wohnzimmer/Küche ist angenehm groß. Da wir Temperaturen über 25°C hatten, haben wir den Kamin nicht genutzt, aber er ist sicher angenehm bei kühlerem Wetter. Bedingt durch die einsame Lage zwischen 2 Ortschaften ist es ausgesprochen ruhig. Die Vermieter sind sehr nett und hilfsbereit und halten sich im Hintergrund. Cambridge, Bury St Edmunds, Norwich und die Ostküste sind nah, bedingt durch die ländlichen Straßen braucht man etwas länger. Es war ein toller Urlaub in einem tollen Haus bei hochsommerlichen Temperaturen. Muy completo el menaje de la cocina, se echa de menos jabón de manos en el baño y unas pastillas de detergente de lavadora. Al ser zona de campo, hay muchas moscas y arañas. Lo de las arañas resulta algo desagradable porque hay telas de araña por muchos sitios. Gates Lodge is situated amongst hundreds of acres of unspoilt countryside and farmland with views stretching as far as the eye can see. Close to the renowned Suffolk Heritage Coast, there are many places of interest nearby. These include RSPB Minsmere, Southwold with its pier, Dunwich, and many transport and aviation museums. Plenty of family activities for all ages, the Norfolk Broads, Pleasurewood Hills, Southwold Maize Maze are just a few musts...see our website! - Leisure pursuits such as golf and fishing within easy reach too.. Situated in an area of Special Scientific Interest and a Nature Conservation area, we are very popular with walkers, cyclists and wildlife watchers, being positioned on the only common area left in Suffolk which still has free roaming horses and which has not seen farming activity for 500 years. Even the site of Jolly Farmers and Gates Lodge has been known to have its own resident Owls, Lesser Spotted woodpeckers, and Turtle Doves amongst other wildlife. Steeped in local history, Gates Lodge, the former cart-lodge and stable for the working horse is the ideal therapeutic base. Golf: There is a nearby Golf Club at Diss and there is also a driving range called Osiers, just outside Diss town, about 15-20 min drive away, usually open from 6am to 5pm. N.B. £75 security deposit is refundable within 14 days of departure. . Cancellation of this booking will attract a minimum deposit charge of £75. Easter, Xmas and new year are counted as peak rate.